Now in our 2nd printing! 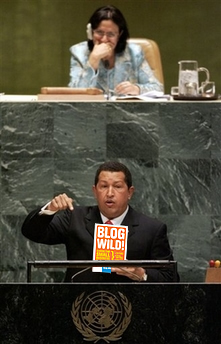 President of Venezuela Hugo Chavez at the UN ranting about Bush ‘the devil’ and recommending all Americans read Blogwild! A Guide for Small Business Blogging. This entry was posted in General on September 22, 2006 by Sharon Sarmiento. Did Hugo recommend Blogwild primarily because he shares a common philosophy with Comrade Wibbels? That photo must be doctored – reliable sources insist he was holding a live snapping turtle, while smoking a Cuban cigan. The smoke annoyed the turtle and he grabbed the nearest object to fan the flames — errrr, fan away the smoke.